Cool mugs make hot beverages taste great! 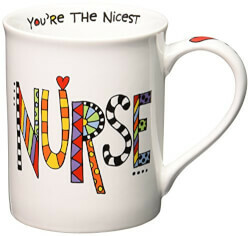 This mug is designed with colorful doodles and typography originally hand-drawn by artists and reproduced on the porcelain. "Thank you for your kindness, caring, and of course, patients," and other funny messages of gratitude, wrap around the outside."